Fannie Farmer, writer of the Boston Cooking School Cookbook, dedicated her infamous 1896 text to Mrs. William B. Sewall, the President of the Boston Cooking School. Farmer believed that Sewall deserved high accolades due to “her helpful encouragement and untiring efforts in promoting the work of scientific cookery, which means the elevation of the human race” (4). However, it is Fannie Farmer’s contributions to scientific cookery that are best remembered. 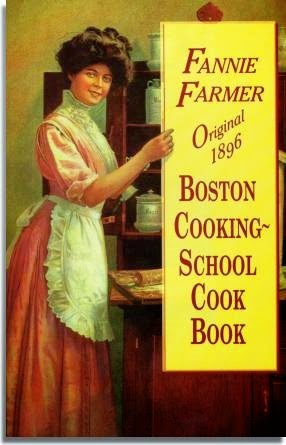 In 1889, at the age of 32, Fannie Farmer graduated from the Boston Cooking School. After completing her studies, she continued to work at the school for over a decade. During this period she rewrote Mary J. Lincoln’s original Boston Cooking School Cookbook. While Lincoln had intended the audience of her book to be professionals trying to perfect their cookery skills, Farmer rewrote the text for housewives. In the Farmer editions, the author made no assumption of her readers having any prior knowledge. Farmer carefully described every component of the recipe with exact measurements. The tone of the text reflected Farmer’s rhetorical style when she taught her tried and tested recipes to her students. Although the book quickly became a bestseller, Farmer had difficulty attracting the attention of publishers. In fact, her publisher, Little Brown, had so little confidence in the book that it required Farmer to pay for the first printing herself. Ultimately Little Brown’s error benefited Farmer greatly as she received a higher percentage of the profits. The book has undergone numerous reprints and editions and was translated into French, Spanish, Japanese, and Braille. Farmer’s last revision was in 1914, the year before she died at the age of 58. Her family continued Farmer’s editorial work until 1974 when cookbook author Marion Cunningham edited the thirteenth edition. Millions of copies have sold worldwide. The publication of The Boston Cooking School Cookbook speaks to some fascinating intersections in late 19th century history. First, the text provides information about the kinds of foods that white, middle class, Christian, Northeastern households ate. Recipes for Boston Brown Bread, Soft Shell Crabs, Tomato Soup, Saratoga Chips, and Apple Pie are among the hundreds of other recipes for beverages, fruit drinks, bread, griddle cakes, cereals, eggs, soups, fish, meat, sauces, vegetables, salads, entrees, deserts, and preserves. As I have discussed on this blog numerous times, the ingredients in cookbooks not only show us the kinds of foods that were available, but also cultural values. Recipes can reveal aspirations as much as realities. Whether or not women actually made all of these dishes within their homes, these food items were part of the milleu in which women and men constructed their own identities, through the consumption, production, and discussion around food and dining. Secondly this text speaks to ideas about health, nutrition, and science. In the last hundred pages, there is a list of recipes for the sick. Farmer’s text is not the first cookbook to include recipes that were either intended for sick individuals or were recipes for actual medicines. For those of you who can recall some of the previous cookbooks that we have talked about on the blog thus far, authors such as Catherine Parr Traill provided instructions to make tinctures, salves, and other medicines. Home remedies dominated medical practices for most of human history. It is actually in the 19th century when the rise of the professionalization of medical practices belittles home remedies, pushes out “quack” doctors, and creates a new professional class that we witness the denigration of home healing. This process continues in the early twentieth century and is most easily described by tracing the shift of home births, under the care of female family members or midwives, to highly regulated birth in hospitals. Does Farmer’s inclusion of recipes for the sick during the late 19th century challenge the medico-scientific discourse and the male dominance of science and medicine? I would argue that it does not. While the recipes for the sick harkens back to female practices of care and healing, most of Farmer’s text supports a medico-scientific discourse. Fannie Farmer was a strong advocate of scientific cookery, or cooking by using scientific methods. Her work uses scientific theories about nutrition and health to determine what kinds of foods to cook and how to create a balanced meal. Furthermore, she advocated for cooking by exact measurements. While most cookbooks informed cooks that all they needed was a pinch of salt or some butter, Farmer praised the use of measuring cups and told readers how to use them properly (p. 27). Oftentimes, Farmer is miscredited as being the inventor of measuring cups. She is not; however, her book popularized this methodology. Farmer believed that these nutritional principles should be part of everyone’s education and that by understanding scientific cookery and nutrition, “mankind will eat to live, will be able to do better mental and physical work, and disease will be less frequent” (p. 8) and that despite changes in modern society “with the progress of knowledge the needs of the human body have not been forgotten” (p. 8). As a result, her book details the chemical breakdown of foods—like “starch subjected to heat is changed to dextrine (C6H10O5), British gum” (6). She routinely stated the exact science behind the kinds of dishes that her readers would cook and in her discussions she would use scientific language and chemical symbols. She explained the actual process of boiling, at what temperature water in fact boils, and more. Her book is filled with charts chronicling measurements and chemical symbols. As a result, we can position this book within the history of science as much as the history of food. Farmer’s book takes its place within the 19th century scientific push of standardization, categorization regarding all points of the body, whether by sexologists creating the terms of homosexual and heterosexual or by nutritionists examining foods. Farmer’s cookbook is as significant to the history of nutrition in the 19th century as Wilbur Atwater’s work on metabolism and quantification of the calorie.